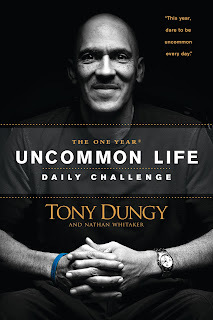 I just finished reading through Tony Dungy’s new book: The One Year Uncommon Life Daily Challenge. For those of you who don’t know, Tony Dungy was a NFL coach who is known for his uncommon exemplary Christian character. I am not much of a football fan, so when I read Tony Dungy’s original book, The Uncommon Life, I found myself not being all that excited or impressed. There were a lot of really good principles on how to be a good person, but not a lot about how you can’t be that good person without Christ in your life. However, the Daily Challenge expounds on the principles of Dungy’s first book and grounds them solidly in scripture and a relationship with Jesus, the feature most lacking in the previous book. The Daily Challenge is basically a daily devotional with some stories from Dungy’s football career. It’s obviously geared more toward the Christian male, but he does try to throw in some stuff for the ladies too. Overall, I’d recommend skipping the first book and just going with this one. Buy this book for $10.87. I received a copy of this book from the publisher for review. All opinions are my own. A special thanks goes out to Tony Dungy and Tyndale Publishing for including a certificate for a free book to be redeemed in your local Christian Bookstore or via mail order to be given away to one lucky reader. The Giveaway period starts today (01/18/12) and lasts for two weeks (02/01/12). Head to the Giveaway page for more details on how to enter for your chance to get a free copy of The One Year Uncommon Life Daily Challenge. I followed Tony and watched as he handled the super bowl win with the colts in the most professional and Christian manner. I have not had the pleasure of reading either of his books, but his godly actions on and off the field would make for a good read I'm sure. Thanks for the review and I will try to check out his book in the near future. What Does Sickness Say About You?